Fed Chair Jay Powell today starts two days of Congressional testimony on monetary policy. His remarks are expected to shed further light on why the Fed shifted to a data-dependent approach in January and cement views of a Fed pause. At the same time, his remarks should echo the dialogue in the most recent FOMC minutes which suggested the Fed would stop quantitative tightening (shrinking its balance sheet) later this year. 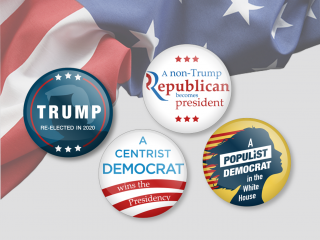 Recall the Fed had received some criticism (including from President Trump) that the US$50 billion monthly reductions in its balance sheet was unduly tightening financial conditions and weighing on risk assets. ING’s house view believes the current Fed pause could resolve itself in one last rate hike – perhaps in 3Q19. However, the bar to that hike looks quite high and the Fed pause could easily turn into something longer – such as the twelve month pause in Fed rates seen between summer 2006 and summer 2007. The Fed Fund futures strip certainly prices that story, with the next full 25 basis point Fed move (a cut) not priced until summer 2021. If the Fed is to be embarking on a long pause, the evidence of 2006 suggests that FX traded volatility levels can fall further – at least until there are clearer signs of a broader slowdown in activity, including the US. 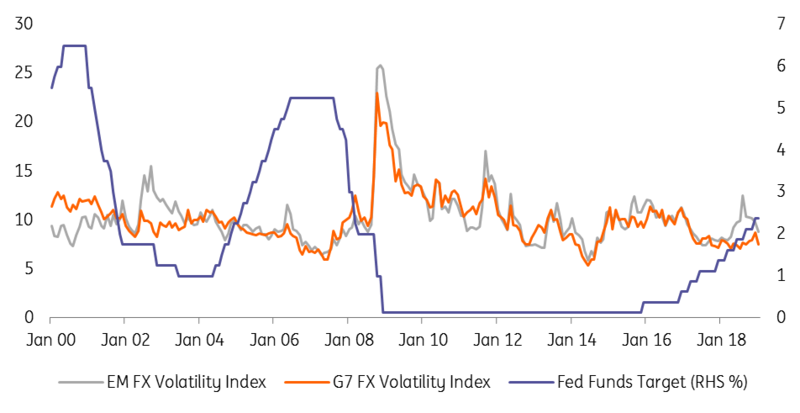 Will FX volatility decline further on a Fed pause? The decline in traded levels of FX volatility are supporting carry trade strategies. These typically perform well during benign periods of growth and when lower levels of volatility are increasing risk adjusted returns. Here, lower traded volatility is a gauge of expected volatility. And the lower the level of expected volatility, the more confidence an investor has in holding higher yielding FX. One measure of the risk-adjusted carry is the carry-to-risk ratio, adjusting 3m implied yield (derived through deliverable and non-deliverable FX forwards) by implied FX volatility. Currently, the Turkish lira stands out with highest volatility-adjusted carry, followed by the Indian rupee, Indonesian rupiah, Mexican peso, Russian rouble and Romanian leu. 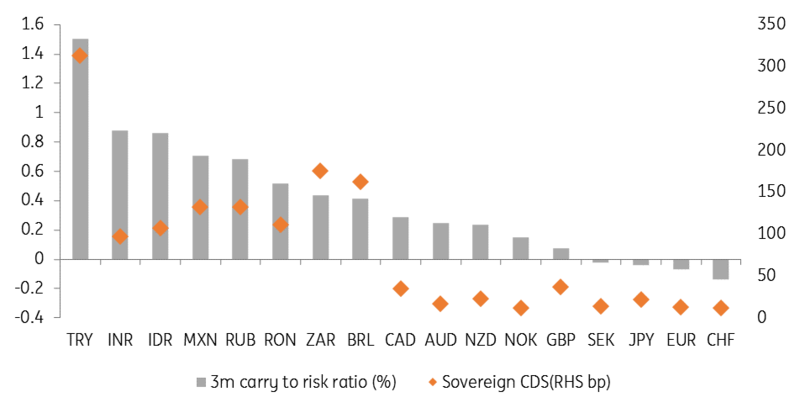 In the chart below, we overlay the carry-to-risk ratio with the sovereign CDS - a proxy measure for country risk. 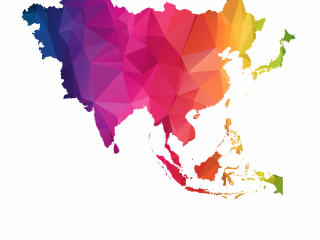 Arguably the INR, IDR, MXN, RUB and RON could be in the sweet spot for higher carry and lower perceived country risk, although difficult elections (April/May), potential fresh US sanctions (late 2Q/early 3Q) and a possible downgrade (S&P ratings due 1 March) could dampen enthusiasm for the INR, RUB and RON, respectively. We have a preference for carry in the likes of MXN and IDR. (TRY is a higher risk proposition, although has its merits). We certainly do favour FX carry trade strategies through the start of this Fed pause, although we would probably turn more cautious into late 2019 when the US is closer to a recession and US equities face more serious challenges. 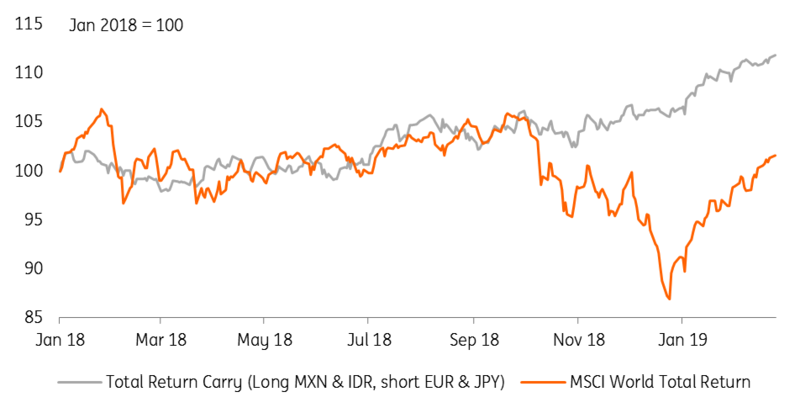 And while past performance is no guarantee of future returns, we do note that a carry basket of IDR and MXN, funded out of EUR and JPY, did manage to avoid the big drawdown seen in global equity markets towards the end of the last year.